Probably one of the best thing about going from a food truck to a brick and mortar is the ability to expand the menu. There is just so many things you can do on a truck but with an actual shop, you have room to experiment and the resources to create more stuff. So when Kim Ima, owner of The Treats Truck, opened her own shop in Carroll Gardens (The Treats Truck Stop), she was able to expand her menu to include savory stuff. On the list of savory items were mac n’cheese, salads, sandwiches, grilled cheeses and BLTs. When I went for lunch, I was torn between getting the chicken salad sandwich or mac n’cheese. Then I saw the BLTA (bacon, lettuce, tomato, and avocado) and of course the combo of bacon and avocado in a sandwich was the an obvious choice for me. 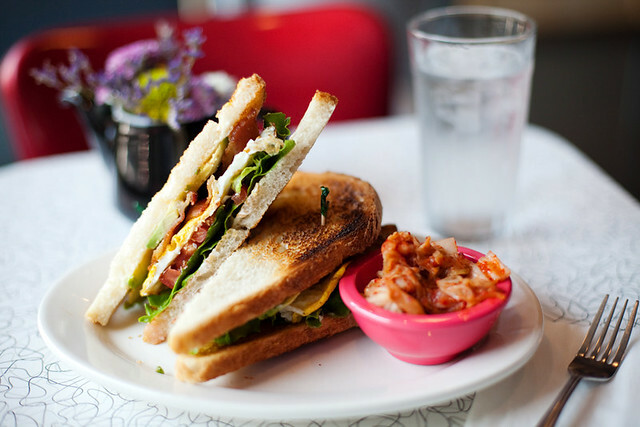 And all sandwiches came with a side of salad, fruit or………..KIMCHI! Yes I got kimchi with my sandwich. Oh and for $1 I added an egg so I guess it was a BLTAE?! The sandwich was delicious….crispy strips of bacon and creamy avocado. Hm…. As for the kimchi, at first I thought it was store bought because it tasted..well like store bought (in a good way) but Kim said she made it at the shop. Wow! Housemade kimchi! I told her she should jar it and sell it.